In 2011 my niece was born with a rare genetic disorder and my husband and I decided we wanted to do something no one would expect of us and running was top of that list. I can vividly remember that first couch to 5k run, using an app on my phone. I couldn't even manage 1 minute at a time, but we had committed so giving up wasn't an option. After my first 10k race I lapsed, but a year later I mysteriously decided to sign up for a half marathon and the rest is history. 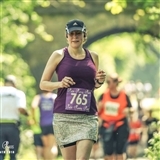 I've learnt a lot about how my body works and with the support of a great physio as well as including strength and conditioning alongside my running I managed to finally run a race pain free within a year. What really changed things for me was joining a Hannah the Runner course. I'm normally a fairly antisocial runner, but I really benefited from the group sessions. Everyone was so supportive and their encouragement combined with excellent coaching from Hannah helped me improve my running form and my times. Everyone has their own reason for running and things they want to get from it. I'm really excited to be part of the HtR team and get the chance to help other people love running and get from it whatever they are looking for, while having fun at the same time.